It has been a pretty busy time for John Bernard Sheridan (known to all as Bernie), who has recently celebrated his 104th birthday at the Tithebarn Nursing Home. Situated in Crosby, it is run by the Royal Masonic Benevolent Institution. Bernard had been initiated into Sincerity Lodge No 292 in 1939, which coincidentally had an affinity with Liverpool FC, through their first manager John McKenna and members of the board. Still as bright as a newly polished silver button, Bernie has been absolutely delighted with all the fuss he has been receiving for his birthday and was undoubtedly pleased with a visit from representatives of Liverpool Football Club. He was ecstatic when presented with a club shirt numbered 104 on the back, a cake and a signed personal invitation to the next game from club manager Jurgen Klopp. Bernie Sheridan (left) with Jurgen Klopp. That next game at Anfield happened to be a thriller against Crystal Palace, a bit of a ‘bogey’ team in recent years for the Red’s. On the day, Bernie, who has followed the club for 96 years, turned up accompanied by his son, grandson and great-grandson. Bernard said of the day; “The club treated us like royalty, it was wonderful, I’ll never forget it. 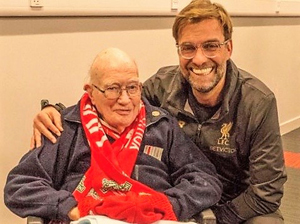 I was taken to meet Jurgen Klopp straight after the match and he shook my hand and wished me a happy 104th birthday”. He also added that “Sir Kenny Dalglish wished me a happy birthday as well and joked that my age was the same as his golf score. I’m made up that we won. I was a bit worried when we lost the first goal, but of course we came back, and achieved a 4-3 victory. There was a wonderful atmosphere, I felt like a celebrity”. Linda Johnson, manager at the Tithebarn, said “Bernard had such a wonderful time; we are thrilled for him”. Tony was in attendance to present Bernie with a special certificate to celebrate his 80 years in Freemasonry, which as previously mentioned, began with Sincerity Lodge in 1939. The Chairman of the Liverpool Group Mark Matthews read the certificate to all assembled, before handing it to Tony for the presentation. During the reading, Mark did make mention that as he was an Evertonian and hoped Bernie would not object to accepting the certificate. Two charitable cheques of £1,000 each were also presented at Tithebarn Nursing Home, on behalf of the WLFC, by the PGM Tony Harrison. These were accepted by Laurie Scott of ‘The Friends of Tithebarn’, on behalf of Tithebarn, and Ecclesholme, another RMBI care home situated in Eccles, the south-eastern part of West Lancashire Province. Tony Harrison presents the cheques to Friends of Tithebarn. Pictured from left to right, are: Tony Harrison, Fred Hulse, Lawrie Scott, Les Norton and John Stallard.